Japanese rock gardens, karensansui, meaning “dry landscape” date from the 14th century and use stones, white sand, bonsai and moss to symbolically represent natural landscapes. In Japan, they are traditionally used as places of meditation by Zen Buddhists. Gravel or sand, sometimes raked to look like waves or rippling water, represents rivers, streams, lakes and the sea. Zen monks originally designed the gardens to represent what they believed to be the pattern of the universe. 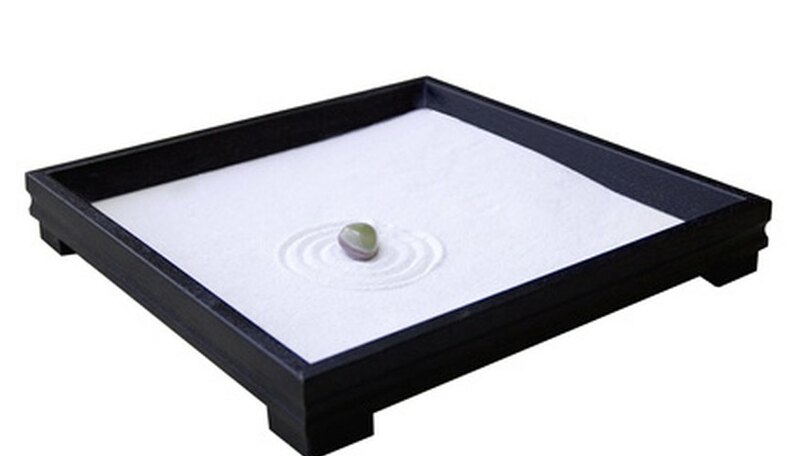 Zen stone gardens are meant for meditation; they should be minimalist, devoid of unnecessary clutter. The Japanese prefer odd numbers of stones, not even numbers. The stones in traditional Zen gardens are arranged in five groups of three stones each, arranged asymmetrically. This number and ratio of stones does not have to be strictly followed, although an odd number should be maintained and the garden should be rectangular in shape. Fine gravel and sand can be raked in flowing lines to look like moving water. A stream of sand, gravel or small pebbles may wind through through a landscape of larger gravel or stones. Spread 2 to 4 inches of gravel or sand over landscape fabric. Small stones, from the size of peas to those as large as potatoes, create fields in the garden and to outline paths of stepping stones. These stones are usually rounded by tumbling in streams. Some are the size of cobblestones or potatoes; small stones in Zen gardens are commonly white but may be black or other colors. Small stones are also used to create a border around the garden composition. Boulders and large stones are often placed to look like islands in a sea of small stones or pebbles. Large stones are sometimes used to form natural arches or bridges in the sea. Flat stones are used as stepping pads on paths through the garden. Raking and arranging stones should be done to create a simple, calm space that is not distracting. Horizontal stones, representing islands or other landscape forms, should outnumber vertical stones. Moss at the base of large rocks or boulders in a sea of gravel or pebbles represent land at the base of a mountainous island. Karesansui gardens are usually meant to be viewed from a single seated position; stones should be placed so their most attractive side faces the person who is meditating the garden from this vantage point.